Foaled in the fall of 1994 Peppy is a Frame/sabino Overo Registered Fox Trotter Stallion. Peppy is his call name. We purchased him in September of 2002. Peppy as my husband has started calling him is a fun horse. To date he has had 6 registered foals. Three of them are true Frame overos. Peppy Is a rare and exciting find. 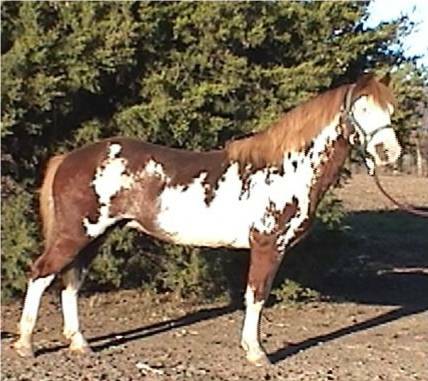 We believe he may be the only registered Frame Overo fox trotter stallion standing at public stud. Peppy is at stud at a fee of $250 plus $5.00 per day mare care. We believe him to be combination of sabino and frame overo. This gives him a 75% chance of producing color. He has a lovely head and small refined muzzle. He is sound and correct and has a magnificent fox trot. He has been blood typed and approved to have foals registered. Peppy according to his breeder was an orphan foal. So we are certainly lucky that he survived to become the lovely horse that he is.